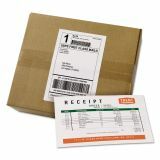 For use with popular shipping software including USPS Click-N-Ship, Stamps.com, UPS, FedEx, eBay and PayPal. 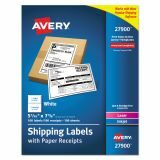 Avery Shipping Labels with Paper Receipt Bulk Pack, 5 1/16 x 7 5/8 , White, 100/Box - For shipping made fast and easy, these labels are designed for use with popular Internet shipping software and services such as USPS Click-N-Ship, USPS Shipping Assistant, Stamps.com Online Postage, UPS.com and Fedex.com. 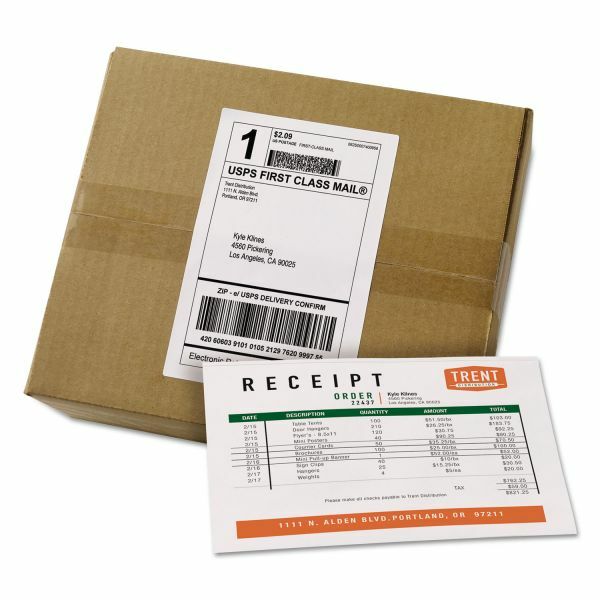 Simply go online and get your packages ready to ship using Shipping Labels with Paper Receipts. Efficient design combines the shipping label and paper receipt onto one sheet so you'll never have to waste another label to print the receipt. The 8-1/2"" x 11"" sheets are compatible with both laser and inkjet printers.